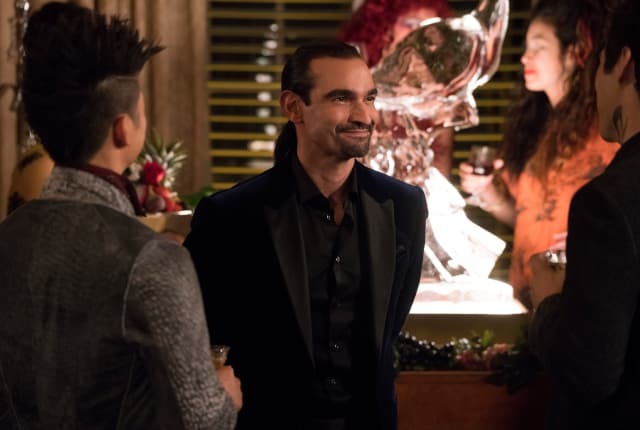 Watch Shadowhunters Season 3 Episode 2 online via TV Fanatic with over 1 options to watch the Shadowhunters S3E2 full episode. Affiliates with free and paid streaming include Amazon. On Shadowhunters Season 3 Episode 2, the Warlocks' magic becomes corrupted by a demonic presence, and Izzy and Luke investigate a string of possessions. Maia: Well, there wouldn’t have been a whole ceremony about it if it didn’t do something. Simon: What if the ceremony was just for her to get my blood? And now she’s making some mutant Daylighter fern? Maia: [Sighs] Yeah, you might be onto something there. Simon: Look, the point is, even if you could find out what the Seely Queen did to me, then what? Kiss my boo boo and make it feel better? Simon: It’s actually to the left. Maia: Now you’re just stealing moves from Indiana Jones. Simon: I did learn from the best. Permalink: Now you’re just stealing moves from Indiana Jones. Jace: But what about you? Clary: Well, I could use a better model. Don’t worry, you don’t have to take your clothes off...unless you want to. Jace: What do you say to dinner? Tonight. Someplace Mundane, just the two of us. Jace: Yes, Clary, yeah. If you want to call it that, a date. Clary: Alright. But, don’t think that gets you out of modeling. Permalink: Don’t worry, you don’t have to take your clothes off...unless you want to.